The culprit in a cosmic collision on Jupiter last year wasmost likely a rogue asteroid and not a comet as scientists originallysuspected, a new study suggests. 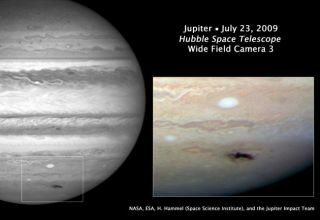 A close analysis of the July 2009 impacton Jupiter in photos from NASA's Hubble Space Telescope led forensicastronomers to suspect that the mystery object was actually an asteroid approximately1,600 feet (500 meters) wide. Evidence of the collision was first seen by Australian amateurastronomer Anthony Wesley, who spotted a large, black spot close to the polarregion of Jupiter? the scar from a mystery object that struck the gas giant on July 19, 2009. "The observation itself was really difficult to dobecause it was after the servicing mission, and Hubble was not ready to observeanything," lead researcher Heidi Hammel of the Space Science Institute inBoulder, Colo. told SPACE.com. "Just the fact that we got the data at allwas a story in itself." The resultsof the study led by Hammel appeared in the June 1 issue of The AstrophysicalJournal Letters. When pieces of the comet Shoemaker-Levy 9 slammed intoJupiter in 1994, scientists were able to examine the trajectory and debris tobetter understand planetary impacts. For Jupiter, the largest planet in our solar system,researchers predicted that such an impact would occur approximately every 50 to250 years. So, when the unknown object collided with Jupiter last year, only 15years later, scientists were puzzled. Hammel and a team of astronomers compared Hubble images ofthe 2009 impact with those from the CometP/Shoemaker-Levy 9 (SL9) collisions from 1994, when more than 20 pieces ofSL9 plunged into Jupiter's atmosphere. The researchers noticed striking differences between the twoincidents, which helped them piece together details about the object in the2009 collision.? "In 1994, the impact sites had a halo aroundthem," Hammel said. "We didn't see that in the UV images for the 2009impact. The shape of the 2009 impact was also a little different ? the site waselongated, so that was a clue that something was different here." The halo around the SL9 impact sites was evidence of finedust arising from a comet-fragment strike. Hubble's UV images also showed astrong contrast between impact-generated debris and Jupiter's clouds. For the 2009 impact, that distinct halo was missing, and theimpact site's contrast also faded rapidly. These discrepancies both suggest alack of lightweight particles, pointing to circumstantial evidence for animpact by a solid asteroid rather than a dusty comet. "The physics that occurs when an object explodes inJupiter's atmosphere is not different, so this leads us to expect that the bodyitself is different," Hammel explained. "The lack of halo surroundingthe impact site suggests that the body in 2009 was not surrounded bydebris." The elongated shape of the 2009impact site also suggests that the object likely had a different trajectoryfrom SL9, and entered Jupiter's atmosphere at a shallower angle. Fellow researcher Agustin Sanchez-Lav?ga of the Universityof the Basque Country in Bilbao, Spain, and his colleagues performed ananalysis of possible orbits that the 2009 impacting body could have taken incolliding with Jupiter. "The trajectory the object followed was in an oppositedirection to that of the previous one, and backward calculation in time of theorbit suggests a 50 percent change for the impactor being an asteroid or acomet-like object," Sanchez-Lav?ga told SPACE.com in an e-mail interview. The study indicates that the object likely came from theHilda family of bodies, a secondary asteroid belt consisting of over 1,100asteroids with elliptical orbits near Jupiter. Future studies that examine the chemistry of the impact sitewill likely provide a more precise identification of the object. "Right now, it's looking suggestive from differentlines of evidence from Hubble and early ground-based observations that this wasa single body acting alone," Hammel said. "There are also detailedstudies of the chemistry of the impact site that are not published yet. Thosemight be the smoking gun that can nail this down." The force of the 2009 collision was equal to a few thousandstandard nuclear bombs exploding, which is comparable to the blasts from themedium-sized SL9 fragments. The largest of the SL9 fragments, which measuredover a kilometer (0.62 miles) across, created explosions that were many timesmore powerful than the world's entire nuclear arsenal if they all blew up at once.? Still, the violent explosions and visible impact sites arenot thought to cause any serious lasting effects on Jupiter. "They're very transient," Hammel explained. "The impacts trigger localized effects, but then a month or two later,they're gone. The 2009 impact happened in July. We took images periodically allthe way through November. By November, we couldn't see the impact site anymore.So, the visible wavelength and ultraviolet traces were gone. That's similar towhat we saw with SL9 in 1994." This recent impact underscores the important synergy thatcan happen between amateur and professional astronomers. "It's a great opportunity for amateurs to contribute toscientific study," Hammel said. "Now that an amateur community hasterrific cameras and vast amounts of time to study Jupiter, it's possible wemay find out that these things happen more frequently than suspected." Indeed, statistical calculations based on available imagingsurveys of Jupiter from Earth-based telescopes indicate that the impact rate of500-meter objects with Jupiter could, in fact, be higher than expected, saidSanchez-Lav?ga. If so, "their detection could be easy with medium-sizedamateur telescopes equipped with CCD (cameras) and webcams," he added. Furthermore, impact studies will help researchers understandthe statistics and overall nature of these events, and will be particularlyhelpful in answering questions about how planets' atmospheres respond toimpact. "These are all important questions to find the answersto, in case we ever find an object that could hit the Earth's atmosphere,"Hammel said. "We can take these findings from Jupiter and we'll be able tofold them back into our predictive models for potentialEarth impact."